Udupi, Oct 22, 2018: Karnataka State Coastal Zone (KSCZ) Management Authority and Department of Forest, Environment and Ecology have given green signal for the extraction of sand from the sand blocks identified in CRZ areas in Udupi and Brahmavar taluks in Udupi district. Following the row over shortage of sand, the district administration had submitted a proposal seeking permission for extraction of sand from the sand blocks in CRZ areas recently. 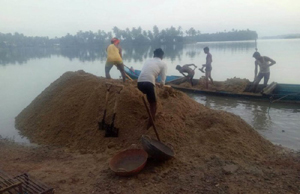 Udupi DC Priyanka Mary Francis said that the authorities concerned have given approval for sand extraction and had also issued guidelines in this regard. The district administration had identified nine sand blocks in Udupi and Brahmavar taluks, of which, permission has been given for sand extraction in seven blocks. A press release from Senior Geologist, Mines and Geology Department stated that the list of sand blocks have been published in the Office of Senior Geologist, Mines and Geology. Eligible sand extractors can apply for permits with suitable documents on or before October 27. Those who had availed permits for sand extraction from mines and geology department prior to 2011 in Udupi and Brahmavar taluks, can also apply, th release stated. “If the sand extractors apply, the permits will be issued immediately without any delay,” Priyanka said. Tenders have also been invited for extracting sand in non-CRZ area as well. The sand extraction in non-CRZ areas will commence after the tender process is complete, she added. In Dakshina Kannada : DC Sasikanth Senthil will convene a meeting of district-level task force committee on Monday to decide on issuing permits for traditional sand extraction in 12 sand blocks identified in CRZ areas in the district. The district administration had sought permission for extracting sand in 22 sand blocks from the Karnataka State Coastal Zone Management Authority and Department of Forest, Environment and Ecology. The authorities had given permission for sand extraction in 12 blocks. It is estimated that about 8 lakh tonnes of sand would be available in these 12 blocks. In spite being ban they used to go on sand mining, but now this is the right time go on..